Arthur Turner was born in Norwich, England where he apprenticed as a coppersmith. After moving to London, he became actively involved in the Social Democratic Party. He emigrated to Canada, living first in Victoria and then in Vancouver. Turner remained a dedicated trade unionist and continued to work for the causes of labour and socialism. He eventually entered politics and represented Vancouver East as an MLA from 1941 to 1966 as a member of the CCF and NDP. 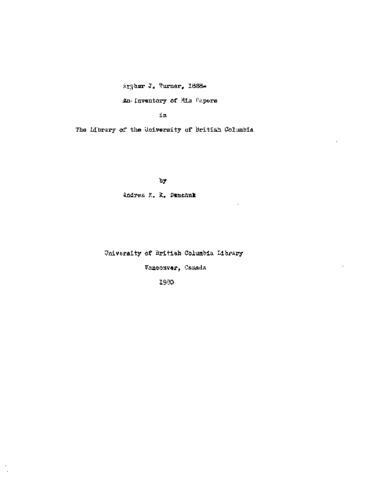 The fonds consists of records pertaining to Turner's activities in the CCF and the NDP in British Columbia. Included are manuscripts of Vancouver Workers' Theatre dramas and poetry, subject files on Israel, clippings, pamphlets on cooperative farming, and records from the CCF Agricultural Committee and the Trade Union Committee.